796€ 2200mm Ø25mm 600g Nemeth Javelins' current world record holder (72.28m) and Olympic champion (2008) HAR (Humane Aluminum Response) competition javelin. 675€ 2200mm Ø25mm 600g Nemeth Javelins' world (1999, 2003) and Olympic champion (2000) and 3x former world record holder (68.19m, 68.22m, 69.48m) competition javelin. 561€ 2200mm Ø25mm 600g Nemeth Javelins' world (2001, 2005, 2009) and Olympic champion (2004) and former world record holder (71.70m) competition javelin. 530€ 2200mm Ø25mm 600g Nemeth Javelins' excellent Nemeth Club 70m Olympic quality HAR (Humane Aluminum Response) competition javelin. Recommended for technically advanced throwers with international level results. Good compensation in case of less accurate release. 381€ 2200mm Ø25mm 600g Nemeth Javelins' excellent Nemeth Standard 70m HAR (Humane Aluminum Response) competition and practice javelin. Recommended for technically intermediate throwers with national or club level results and combined event athletes. Good compensation in case of inaccurate release, assures landing with tip first. Suitable for both practices and competitions. 306€ 2200mm Ø25mm 600g High quality "traditional" Nemeth javelin. 284€ 2200mm Ø25mm 600g High quality "traditional" Nemeth javelin. 241€ 2200mm Ø25mm 600g High quality "traditional" Nemeth javelin. Recommended for technically beginner throwers and students. Good compensation in case of inaccurate release. Suitable for both practices and competitions. 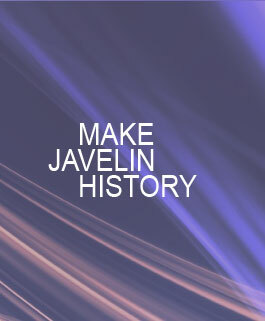 You can download our Women's Aluminum Competition Javelins catalogue here: Women's Aluminum Competition Javelins Catalogue.